For many forum members the Master System was their first games console. 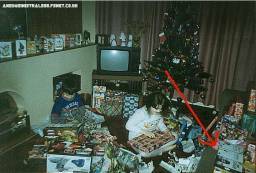 This page is dedicated to the people who eagerly opened their Christmas presents and discovered they had the best 8-bit console ever! Look through this page; see the happiness on their faces? You know they defiantly got exactly what they wanted for Christmas! "Taken in the Christmas of '89 or '90. I can't quite remember as I was quite young at the time. I'm the little guy who's head is sticking out the top of the box. 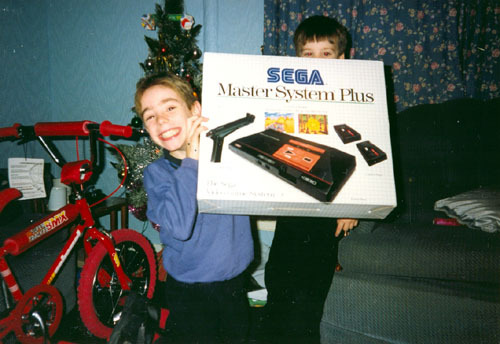 Check out the amazing look of joy on my brother's face, that's what getting a Master System was all about. I recall the games I got at the time being Action Fighter, Secret Command and possibly Double Dragon, which I still love to play to this day. Ah, those were the days. I also got that sweet BMX too!" "My infatuation with the Sega Master System first started on the Christmas of 1988, my mum & dad got me a Sega Master System with Hang-on/Astro warrior cartridge, Space harrier, Choplifter and Shinobi - amazingly still my favourite game to this day! The system was a joint present between my sister and me; we had a great Christmas that year. " So are you looking to buy a new console this year? I hear the salesmen of certain companies are still offering sound advice! Got memories to share? Send photo and a few words to andy@sega8bit.com and I'll update this page.